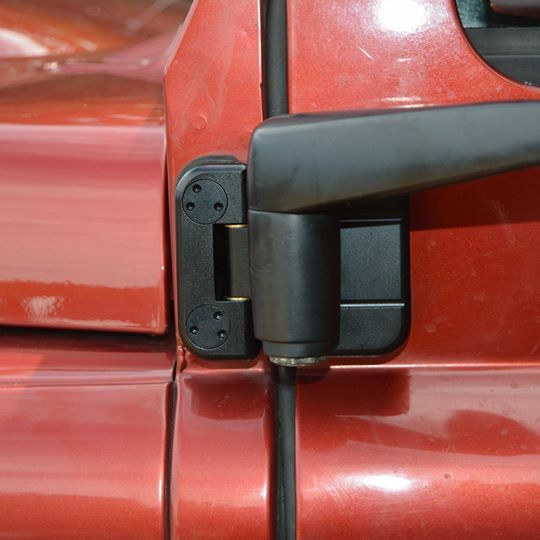 TMD Security door hinges for Defender 90 & 110. Each Hinge is Manufactured out of billet aluminium. Vapour-blasted and anodised in Black. On the front side of the hinge they are first supplied with a Security fixing bolt, so that the hinge can be attached to the bulkhead or the B-post on a 110. They then have a security cap which screws in on top of this bolt. A unique key for every batch produced will be supplied with the kit. The door pins are stainless steel and have a brass bush to stop wear between the pin and the aluminium, these pins are machine pressed into the hinge. 90 Kit Contains:- 4 x Hinges, 8 x Stainless Steel Studs, 8 x Security Bolts, 8 x Security Caps, 1 x Security Key, 4 x Plastic Shims. 110 Kit Contains:- 8 x Hinges, 16 x Stainless Steel Studs, 16 x Security Bolts, 16 x Security Caps, 1 x Security Key, 8 x Plastic Shims. Please note the 110 kit does not have the holes in the back door hinges, as there are only mirrors on the front doors.